If you have diabetes, whether it’s type 1 or type 2, your doctor likely recommended a diet endorsed by the American Diabetes Association. But did you know the diabetic diet recommends foods that could be slowly worsening your diabetes condition? Turns out there is more to a diabetic diet than grams of carbs and sugar, although those are vitally important. For people with type 1 diabetes and for an estimated 20 percent of people with type 2 diabetes, diabetes is an autoimmune disease. This means the immune system is attacking and destroying the parts of the pancreas involved in insulin production and regulation. Over time destruction is severe enough the body can no longer adequately regulate blood sugar. 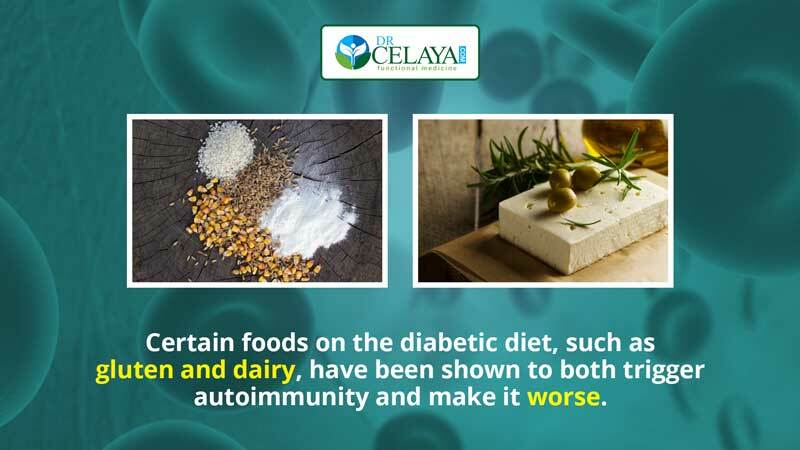 Certain foods on the diabetic diet, such as gluten and dairy, have been shown to both trigger autoimmunity and make it worse. People with type 1 diabetes, which begins in childhood, understand diabetes is an autoimmune condition. 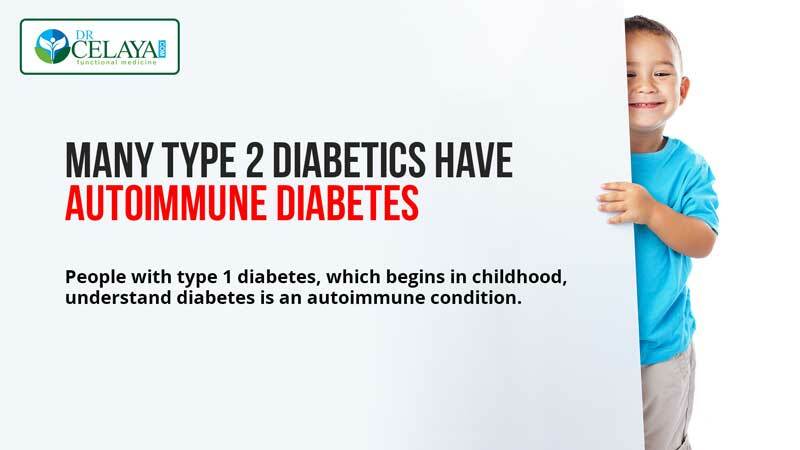 However, many people with type 2 diabetes can go for years without knowing there is an autoimmune component to their diabetes, which generally sets in during adulthood. This type of diabetes is called type 1.5 diabetes, latent autoimmune diabetes of adults (LADA), or even double diabetes. Type 1.5 diabetes involves the lifestyle components of being overweight or obese and eating a diet that promotes high blood sugar, along with the autoimmune component that slowly destroys the insulin-producing abilities of the pancreas. Although grams of carbs and sugars are vital considerations for people with all types of diabetes, what is overlooked is the immune reactivity of foods. Research shows a link between certain foods and the triggering or exacerbating of autoimmune diseases such as type 1 and type 1.5 diabetes. If you have an immune reaction to certain foods and consume them daily, they are going to keep the immune system in a constant state of inflammation and attacking body tissue. This makes blood sugar continually difficult to manage, despite careful consumptions of carbs and sugars. The two top foods to avoid if you have autoimmune diabetes are gluten and dairy. Both have been linked to a number of autoimmune diseases, including diabetes. Gluten has been shown to trigger an autoimmune attack against the GAD enzyme which plays a role in insulin regulation and brain function. Casein, the protein in dairy products, has also been linked with autoimmune diabetes. If you have a sensitivity to these foods or other common immune reactive foods, it is worth getting tested or doing an elimination diet Knowing which foods are provoking an autoimmune attack can help you better manage your type 1 or type 1.5 diabetes. Ask my office for more advice on ways to tame inflammation and manage your autoimmune diabetes. 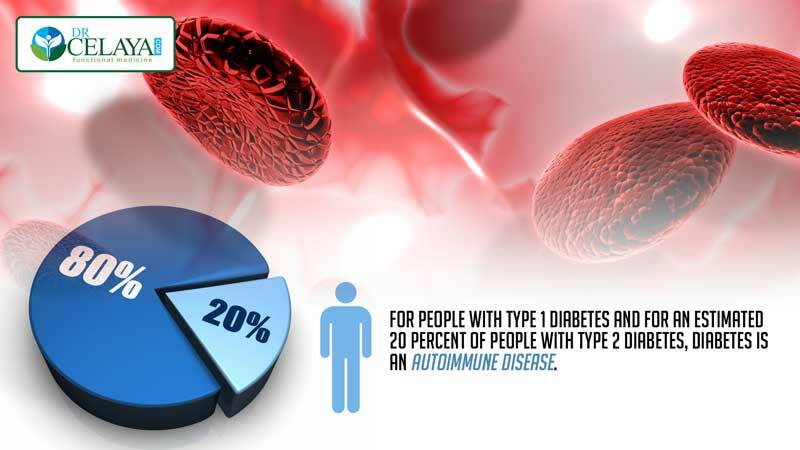 If you have type 2 diabetes, it’s important to rule out autoimmunity. Click here to schedule a FREE 15 minute consultation.